Percy Danvers (Peter Brace) is pursued across some wasteland by Robin (Clive Colin-Bowler). He slips on a towpath and drops his pistol into the canal, whereupon Robin lets fly a volley of bullets from his sub-machine gun. Danvers leaps a barbed wire fences and races to a nearby fire warning tower to use the emergency phone. While he's talking to Steed, Robin catches up and shoots him through the floor and Danvers falls, spilling not blood, but bird seed. 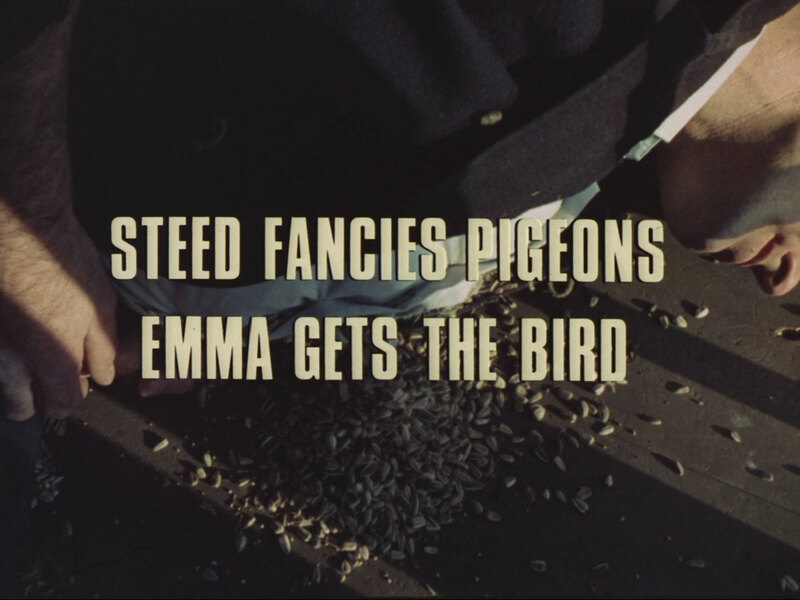 Emma opens her living room curtains in the morning, only to have an arrow shoot past her and slam, quivering, into the wall with a card tied to the shaft reading "Mrs Peel We're Needed!". 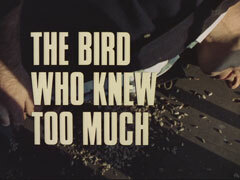 Steed appears at the window and whisks her away to examine Danvers' corpse, and they puzzle over the bird seed. That night, counter counter counter espionage agent Frank Elrick slips a pigeon into the cage on the back seat of an Austin parked at a building site, and takes a photo of a missile base from the floor of the car. He's surprised by Verret (Michael Coles) and makes his escape up some scaffolding, pursued by Verret and Robin - who loosens some of the scaffold, causing Elrick to plummet into a slab of recently-poured concrete. Steed is at Emma's flat, meticulously checking seeds for hidden transmitters or microdots when the pathological lab rings - they've found Elrick's body at the construction site. He's chipped out of the slab and Steed confirms it's Elrick and finds the aerial photo of the Muswells Back base in Elrick's wallet. He's puzzled, as the flying is prohibited near the base. He decides to visit Elrick's partner, Mark Pearson who would know more about the case. Pearson meanwhile is dressing for a date when a pigeon arrives in his coop. It's not the one he's waiting for however, and moments later he's shot by Verret, who spots Steed and Emma enter as he's leaving. Pearson manages to gasp that the secrets are being couriered by Captain Crusoe before dying while outside Verret contacts his commander who tells him to kill Steed. Inside, Steed rings headquarters to check the army and navy lists, and to have Pearson's body removed while Emma goes to investigate Heathcliff Hall, which she'd found mentioned in Person's papers. Steed finds a musical triangle and some photos of a pretty blonde, who promptly turns up and, after a brief tussle, introduces herself as Samantha Slade (Ilona Rodgers), Mark's lunch date. Steed blusters about Mark's absence and takes her to lunch himself. At Heathcliff Hall, Emma finds herself in a room full of cages of exotic birds where she is confronted by the acerbic Edgar Twitter (John Wood) - she drops Captain Crusoe's name and Twitter offers to introduce her, as the Captain is there. Sam and Steed are chatting over lunch, but she clams up and leaves hurriedly when Steed mentions Crusoe. At the Hall, Emma meets Twitter's assistant, George Cunliffe (Anthony Valentine) and prepares to meet the captain, who turns out to be "a king, an emperor among parrots" but the cage is empty, much to their horror. Steed escorts Sam to a studio where the photographer, Tom Savage (Kenneth Cope) mistakes him for a model and presses him into mincing for the camera. Steed subtly asks him about his darkroom gear, and whether he does aerial photography, then prods Sam for more information. Verret sneaks in and puts an impact grenade inside Steed's brolly but our hero spots it when he leaves the studio and hurls it to the ground while diving back inside. He emerges to find the brolly obliterated and his bowler's crown torn. Steed and Emma compare notes and realise the photo was taken from bird height, so Steed waits at Pearson's flat, armed with caviar and champagne (sound familiar?). Emma insinuates her way into Savage's studio and Sam arrives with an important prop for her shoot - Captain Crusoe! Robin and Verret meanwhile are near Muswells Back with more pigeons - Robin notices that one flies West instead of Northwest and they take off after it. 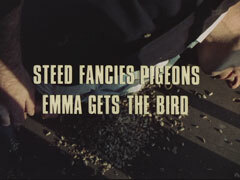 The pigeon arrives at Pearson's flat and Steed has just examined the miniature automatic camera on its foot when Robin arrives and clobbers him. Emma get a print of her with the parrot, but Twitter and Cunliffe can't make a positive identification from a photo - Cunliffe notices Savage's name on the print and she promises to get the bird. She breaks in later but Verret and Robin ambush her in the darkroom and tie her chloroformed body up. Steed regains consciousness and calls her flat, and the three-hour old message about going to Savage's studio send him hurrying to her aide. The villains need an alibi, so they've tied Mrs Peel to a chair facing the door, attached to which is a pistol which will be fired by the door opening. Fortunately, Steed is devious and once again comes in the window. 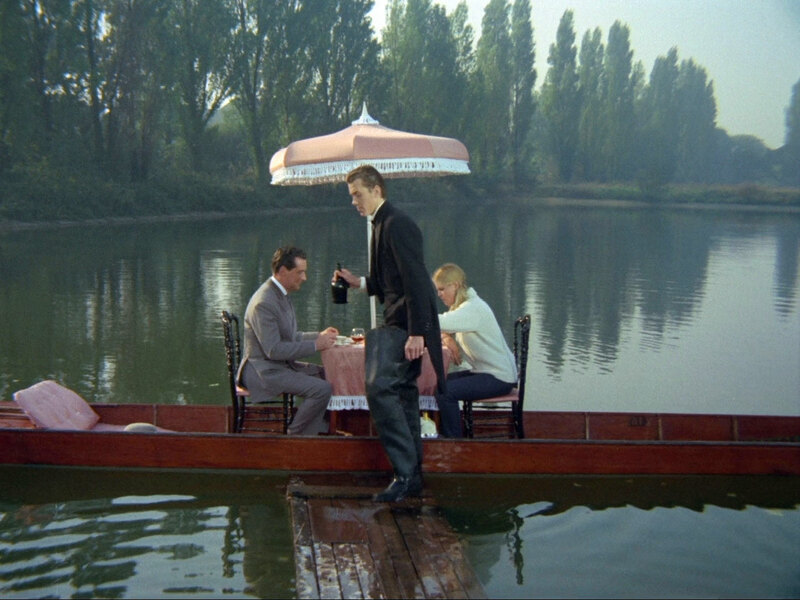 He takes her to her flat and plies her with champagne to 'pick her up' for their next effort - finding Captain Crusoe. Emma returns to Heathcliff Hall and buttonholes Twitter about the parrot's theft from the studio. Twitter reminds her that Cunliffe, too, knew the bird was there, and Cunliffe chips in that Twitter had told the bird's owner, Professor Jordan. Later, Verret gives Robin a sniper rifle, telling him Mrs Peel has been causing trouble and he's to kill her and Professor Jordan. In Jordan's house, Emma finds a bird classroom, and sets the 'pupils' off when she backs into a stand of triangles. The cacophony is silenced by Jordan striking the triangles and he explains his training system of cueing the birds with particular notes, while lamenting the loss of Captain Crusoe. Crusoe could learn any phrase, and mimic the tone and intonation of the person who taught it to him. Crusoe is cued with a top C, so anyone can identify him with his triangle. They go to get the triangle from Jordan's car and Robin opens fire on them. Jordan keeps him busy with Emma's revolver while she sneak around behind and overpowers him. Unfortunately, he can't tell her whose behind the plot, but reveals that the bird is "back where he belongs". Steed meanwhile interrogates Sam, who's turned up, claiming Mark called her. 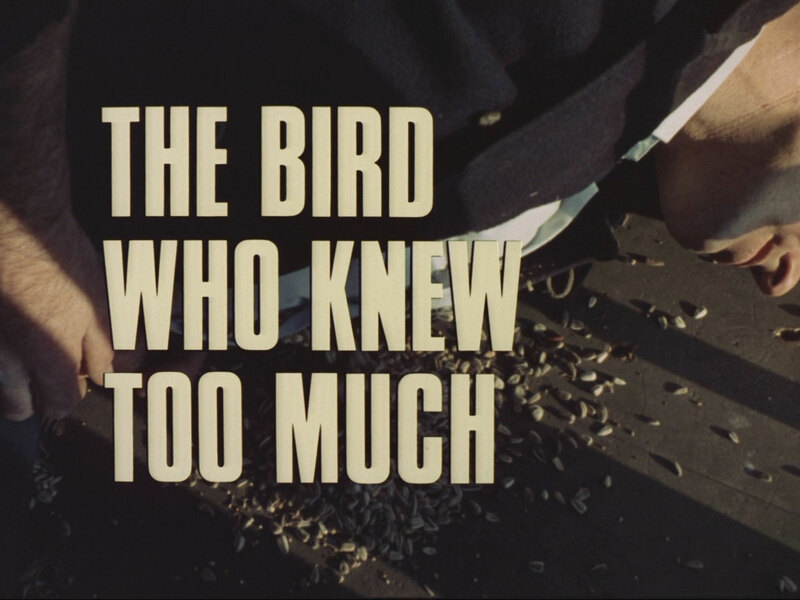 Steed reveal that Mark is dead and she tells him that she though Mark had stolen the parrot, which recited details about the missile base deployments and technical details. "The parrot's taking the information out! ", Steed and Emma cry in unison as she bursts in. No human error, no papers, microphones or microdots - pigeons take the pictures, which are described to the parrot. 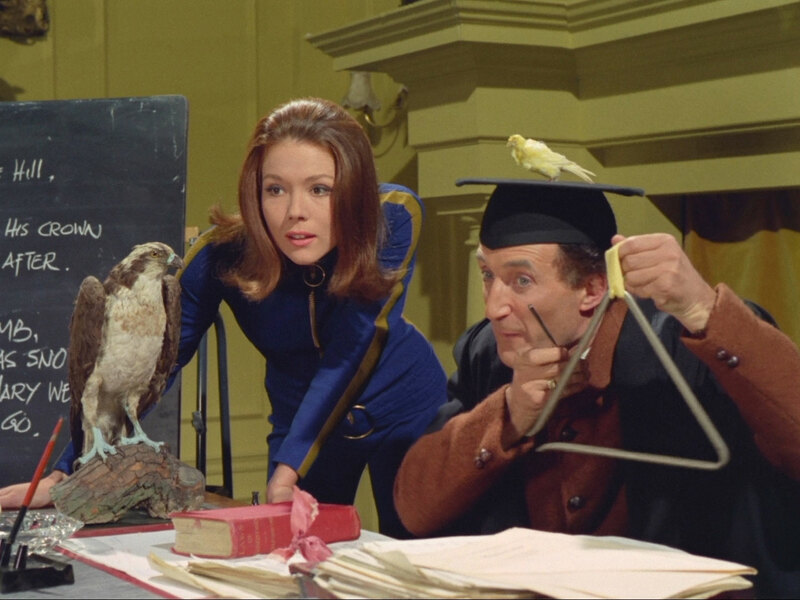 At Heathcliff Hall, the Avengers find the parrot in the back room, and knock out Twitter when he confronts them. Crusoe's triangle is struck in the struggle and he starts talking - in Cunliffe's voice! Cunliffe appears with a pistol and summons Verret to kill them, but the Avengers leap into action, Emma fighting Verret and Steed taking on Cunliffe. The villains dispatched, Captain Crusoe demands political asylum until silenced by Emma striking the triangle.